When Tampa is throwing: I believe Mike Williams, Kellen Winslow and Preston Parker are enough weapons to be featured in a proficient passing offense. The offense looked good again Sunday, yet it was another week in which Freeman could not throw more TDs than INTs. The most important statistic is points scored. The Buccaneers went up against the Super Bowl Packers and put up 26, tying their season high (also scoring 24 in two games). The Titans secondary has one legitimately good defensive back (who I’m still upset at for holding on Anquan Boldin in the end zone; Just joking) in Jason McCourty and they have a very limited pass rush. Gone are the days of Albert Haynesworth, Kyle Vanden Bosch or Jason Babin. Tennessee has 19 sacks, 6 of them from tackles, and none of the other players have more than 2. The Bucs will have some momentum from last week. Edge: Tampa, slightly. When Tampa is running: Blount gets to take on the team that cut him, one week after Blount ran over the Packers in legendary fashion, putting him in the spotlight. The Titans averaged giving up less than 90 per game during the first four games, but have looked slightly more susceptible in the weeks since: they’ve allowed 174, 222, 158, 109, 113, and 116 in the six weeks since. The Titans will get maximum effort at home, two weeks after the Schaub injury and one week after inspiring Jake Locker comeback, and one of the ways you see that is in run defense. The Titans will dare Freeman to pass. Edge: Tennessee, slightly. When Tennessee is throwing: Matt Hasselbeck is playing hurt, something that held the Seahawks back in recent years, among MANY other things. Raheem Morris probably takes the secondary’s woes as personally as Ronde Barber – who said “I’ve never been so despondent after a loss.” after the collapse against the Titans – and can push the right button. The Titans should have added T.O. or Bernard Berrian. They have three great #2 receivers who are developing but not consistent yet. The Bucs give up the big play, and there’s no one on the Titans team that is making those right now. Edge: Tampa, slightly. 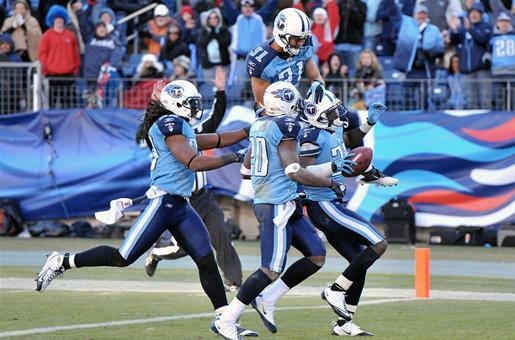 When Tennessee is running: The Titans are 31st in the NFL with a 3.4 yards per attempt. The Packers averaged just 3.9 against Tampa Bay last week. Edge: Tampa, slightly. PREDICTION: Both of these teams have looked great against bad teams and struggled against good ones, save for the Titans’ game against the Ravens week 2 and the Bucs’ wins over the Falcons and Saints. It’s a playoff game and the Buccaneers are going to carry over their offensive success from last week. The Bucs still need a lot of help to get a Wild Card spot. Buccaneers 28, Titans 27.